I’m not even going to make any excuses, but since I recently went from working 45hrs a week to working 3 hours a week, I’m pretty sure I’ll have enough time to resume THE BLOG. Up first is the Gaia’s Voyages Mega-Review for the WONDERFUL Elaine Barrett, who consistently reminded me all throughout my hiatus that I was supposed to be reviewing. Well, it’s not here NOW, sheesh. But I’ll be working on it this weekend – check back on Monday 11/29 at the latest! … and I’m serious this time. So, the long and short of it is, this is the official announcement of my return to the audio drama blogosphere. Sláinte. Ooh, it’s good to be back. EDIT: Haha, I got fired. New posts coming soon. I recently got a job with an environmental protection group called Environment Minnesota, as part of their fundraising team. It’s a fun, challenging job, but it really eats up the day. I leave home at 10am, and I don’t get back until around 11pm, sometimes later. I have one other writing project apart from this blog, and both of them are going to have to briefly take a back burner so I can handle everything else that’s suddenly going on in my life. For a variety of complicated reasons, I am no longer eligible for financial aid for college, and I need to work as much as I can and save up to hopefully go back to school in 2011. I’m going to try to work on the blog and write as many reviews as I can, but working a 10 hour day and still having to make room for all the necessary household chores and, of course, eating and sleeping, is really going to limit my window of writing opportunity. I have a couple reviews (Leviathan Chronicles, Gaia’s Voyages, The Byron Chronicles) that were in various stages of completion when I got the job. I’m working on those a little at a time whenever I have a few spare minutes, but there’s no way I can take on any new projects and remain sane. The good news for those of you who enjoy reading this blog is that this job has a ridiculously high turnover rate. There were six of us in my training group. Of those six, only one person besides myself managed to last out the week and become a full-fledged staff member. The money is pretty good, though, so I’m going to keep it as long as I can. Still, the fact remains that my employment situation is very precarious. (Fun Fact: The average employee’s “lifespan” is 2 to 3 weeks.) Its very possible that I could be back doing the whole reviewing thing sometime this week. Or, I might make it until August. No one knows… but I’m going to try to finish and post the reviews I’ve been working on, so that we avoid the internet equivalent of dead air. So, in short, Happy 4th of July / National Explosion Day / Annoy Your Neighbors Day / Blow Sh*T Up Day / Etc. Regular programming will (hopefully) resume shortly. As always, here there be spoilers. Read at your own risk. EDIT: Sorry about the formatting towards the end – I dunno what’s wrong with it. The first story to grace Twilight Theatre is called “Outside the Box”. Adapted from the short story by author Lynne Jamneck, “Outside the Box” is an interestingly mixed combination of SciFi elements and noir-style storytelling. The narrator is a hard-edged female P.I named Fin, living and working in the California of 2027. Fin is hired by a woman named Stella to find her missing McCallister box – a technological marvel that can hold anything, big or small – that contains her dreams. I have to admit, the ending of this one confused me until I tracked down the pdf of the original story. This was no fault of the superb retelling by the folks at Brokensea… Its the exact same reason that O. Henry’s stories always confused me back in school. I loved them, but I had to do some re-reads before I figured out what happened in the last two sentences. “Outside the Box” is a lot like that – I’m still not entirely certain whether or not the events of the story were actually happening, or whether they were a dream from the box. I’m inclined to go with the latter, but I’ll let you decide for yourself. In any case, it’s worth a re-listen or three. “Sides” is a tale with a much heavier SciFi aspect. I’ll admit, my first thought when I started listening to this one was, “Oh God, please don’t let the entire thing be narrated by this robotic voice.” It wasn’t, and I have to admit, it was a really cool intro/outro. I was just really worried there for a second. Adapted from an audioplay by Mike Murphy, “Sides” tells the story of Trevor Lloyd, an accomplished and talented spy for a party known only as The Confederation. The opening scene finds him in a cell in an enemy facility. The enemy, or The Alliance, wants not only the knowledge in his head, but for him to change sides and become spy for them. They try every tactic, from starvation to threatening him with an angry mob, but the ultimate test of Trevor’s loyalty comes from an unexpected source. The story had a great twist ending, even though I was admittedly able to guess the last bit after the big reveal. The fact that it was his own people, the Confederation, who had locked him in the cell and tortured him was a complete shocker, however, and it was very well done. In the end, Trevor decides to actually switch sides because he doesn’t want to work for someone who doesn’t trust his loyalty. It’s a great ending, if a little predictable, but very well played. I really enjoy anthology-style shows such as this one, and DP’s ‘Night Terrors’. While I like the continuity of ongoing series, there’s no denying the fact that the variety and freedom to to pretty much anything from episode to episode is pretty exciting. There’s no knowing what the next episode of Twilight Theatre will be, but based on their current record, I’m not worried. So, here’s to more creepy, SciFi fun in the near future! Listen to Twilight Theatre here! Don’t forget to download! Darker Project’s “The Byron Chronicles” Season 3 Premiere! Silly Things / Humorous Podcasts – Recommend me some! Planning that far ahead is giving me a headache. My uncertain internet connection and the need to find a job and a place to live before August means that the update schedule might be a little spotty, but I’ll try to get at least one post up every other week. The Byron Chronicles Season 2 Finale, AKA: Can I Start Crying Now? I make jokes about being at a loss for words when it comes to writing reviews for The Byron Chronicles. Those jokes are based in truth, but are still slight exagerations. I’m never at a loss for words, and yet it’s taken me quite a while to figure out what to say in this review. It’ll probably be quite disjointed and make only a little sense, because even an entire day later, my brain is still going up and down and around and around like a frog on a trampoline in a dryer. Oh, and the frog is drunk, blind, and made of rubber. The Byron Chronicles: The Hour of Portland begins with widespread chaos and news anchors being devoured, and pretty much gets better from there. Byron goes after Chris, leaving Dmitri’s vampires and Katherine’s Order operatives to protect the city. As soon as he leaves, however, Katherine decides to pull out and take the Order’s favorite approach to solving problems: bombs. Yes, just like in ‘The Taint’, the Order’s troops plan to firebomb Portland to remove the threat once and for all. Meanwhile, Dracula is being a bad person, trying to make Chris feel better about the fact that she’s about to facilitate the rise of the greatest evil known to man by telling her that she’ll be a martyr, revered and seen almost as a goddess. Obviously, this doesn’t make her feel better at all, since…it still means she’s going to die. Meanwhile, the Order is setting up their bomb, Dmitri makes a treaty with Lycan leader Ryuk after saving his life from a Revenant, and Felix is mean to Katherine, who definintly deserves it. This is all very important stuff, but I’ll come back to it later. Dracula buggers off. Byron tries to save Chris, but he’s too late. She’s become a part of the machine opening the portal, and there is no way to free her. No matter what he does, she’s going to die. So, he has to kill her in order to stop Leviathan from entering the world. Let’s get that one more time, ’cause…I don’t think I heard it right. Byron is stuck between the hardest of all hard places (as in, say, a mountain made of adamantium-covered dimonds, reinforced with titanium) and a rock the size of the entire universe. He has to kill Chris. THERE ARE NO WORDS FOR HOW SAD THIS MAKES ME! As I mentioned before, I have formed emotional attatchments to these characters over the last two years. It also makes me sad, because its one more person Byron cares about that he’s had to kill. Oh, one more reason it makes me sad: Laura Post is brilliant. I’m going to miss Laura Post. Let’s everyone give Laura Post a big round of applause for being awesome as Chris Sparrow, and just in general. Oh, and one more reason why this makes me sad. I mentioned somewhere up there that Dmitri and Ryuk formed a tentative alliance against Dracula. They killed Branlaven and chucked his head at Dracula (Yay, happy…) and at the end of the episode, the two formerly opposing leaders made plans for a treaty. Dmitri even made a comment about humans, Vampires, and Lycans working together to stop the evil. Here’s what this has to do with the sadness of Chris dying: Byron had been trying to make a new Rome in Portland, where all the races lived together in cooperation. That happened in this episode. So, in a way, he suceeded…but at the same time, he failed to protect Chris. Succeess and failure at the same time. I think there’s even a mathematical equation for that: Enormous Failure + Small Success = Enormous Failure. Now, I kind of knew Chris was going to die — I had some theories, I asked some questions, I took Piece A and put it next to Piece B, etc… It made me sad, but I’ve had almost three months to get used to the fact that Chris Sparrow was going to die. Did that mean I wasn’t crying when I listened to the end of this episode? No. I was definintly crying. There were tears. Everywhere. But wait, there’s more! Believe it or not, this was not the big shocker moment in this episode. Hoo, no. Writers Eric Busby and Mark D. Wrenchild aren’t satisfied with pouring three doses of liquid aweome into our brains. They need a fourth, too. Oh, by the way. He’s Leviathan. And he will have his vengence. 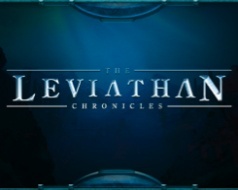 Here I am over the course of the last year or so, thinking Leviathan is, in this order, no jokes at all: invisible, a giant space whale, Lillith, Cthulhu, a group of immortals in an underwater city, a giant space creature again, or Logan. Leviathan is none of these things. Leviathan is a Creepy Gloating Cloaked Guy. I think that I have nothing further to say. 1. My brain. It exploded. 3. Thank you so very much, cast and crew of The Byron Chronicles. All the writers, mixers, actors…everyone. You’re all brilliant and wonderful. You’ve also destracted me from finals studying, but I can lay most of that blame on the shoulders of Hulu and Monty Python, so nevermind that. This show is quite possibly at the top of my list of favorite things, and now, it’s been stuck there with industrial-strength cement. Made out of adamantium. This story may be ending soon, but my obsession with all things Byron is not. Oh, and by the way: You guys got three or four standing ovations from my end alone. I’ve gotten my friends hooked. So, congratulations on a job well done. I wish I had more thumbs, so I could put them up. Download or stream The Byron Chronicles: The Hour of Portland, the wonderful Season 2 finale episode, by clicking here. There seems to be a rule about the middle episode in trilogies. No matter how awesome and epic it is, it just seems like a bridge between parts two and three. Middle episodes don’t have their own beginnings or their own endings, and because of their spot plunked right in the middle, they have to work extra hard at being memorable. However, like the yummy goodness in the middle of a sandwich that keeps it from being more than just two pieces of bread in a little stack, middle episodes can make a trilogy awesome. This is one such Part Two of Three. I, for one, am very glad to see the long-awaited return of ‘DP Who’. It’s been several months since the release of The Dreamers, Part 1, and since I have an extreme dislike for cliffhangers and would like them to be resolved as quickly and epically as possible, I was greatly saddened by the lack of updates. Ohhh, but it was worth the wait. It was definitely worth the wait. Part Two picks up right where Part One left off: With the horses vs. the Doctor and an unfortunate civilian. In true Doctor style, everyone’s favorite Time Lord agrees to go along with the pretty, shiny, deadly horses in order to avoid the loss of human life. Meanwhile, Emma is getting homesick for the home she can’t go back to as she flees the museum via the tunnels. Her dislike of the Doctor is outweighed by her dislike for their present situation, and she decides to find him and get the hell out of 2011. The Doctor is with those pretty shiny horses, though, and those horses know who and what the Doctor is…but, being the Doctor, he also recognizes them. Turns out they haven’t always looked like horses, and are actually creatures called Taibhsi (it’s Celtic). The Taibhsi are using the energy from people’s dreaming minds and their imaginations to open a portal to bring them fully into our world, but they’ve encountered some difficulties. They need more energy to keep the portal open, and they want to get that energy from the Doctor’s mind. Emma shows up to rescue the Doctor, but when she wakes him up, Jason wakes up instead…for a few moments, anyway. Unfortunatly, he turns back into the Doctor as soon as she starts kissing him. Then they start having a stubborn contest, which ends with Emma beating up the horses’ meatpuppets. The stubborn contest continues in the tunnels but gets interrupted by a Tube train, and the Doctor and Emma take a detour that plops them both right into the Taibhsi’s horsey clutches. The Taibhsi take control of Emma’s brain, and attempt to take over the Doctor’s… and then come the credits. Guess we’ll have to wait for the conclusion…yay, waiting. The only ‘issue’ that I had with this episode is that the weird echo-y quality that the horses’ voices had in part 1 is gone…part of a re-mixing of the first episode. (Remember when it was taken off the site right after it was first put up, and then a while later Part 1 2.0 appeared? Yeah, I got lucky and downloaded the original version.) The scary horses are less scary now, for me anyway, and I miss the old voices. That’s all I’ve got, though. Everything else was brilliant. The only thing I know for sure is that Dreamers Part 3 is going to be pretty amazing. It’ll be the final piece of bread on this sandwich of awesome. Download Doctor Who: The Dreamers, Part 2 right over HERE, or from wherever you usually get it.